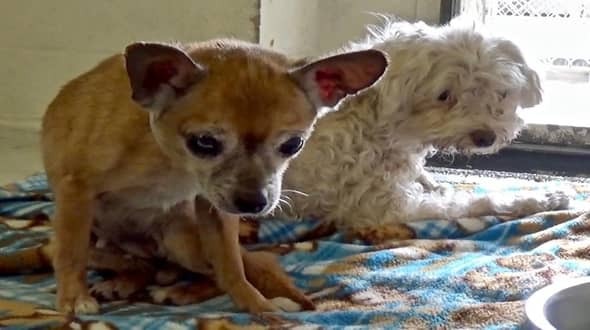 #A5183597 I'm an approximately 10 year old female Chihuahua. I am not yet spayed. I have been at the Carson Animal Care Center since 5/29. I will be available on 6/2. You can visit me at my temporary home at C234. #A5183596 I'm an approximately 8 year old female Maltese. I am already spayed. I have been at the Carson Animal Care Center since 5/29. I will be available on 6/2. You can visit me at my temporary home at C234. INTERESTED IN FOSTERING? If you're in LA, OC, San Bernadino or Riverside County and would like to apply to foster a Carson pup, please Carson Shelter - 310-523-9566 to complete the foster application. Fidonation, if you or someone you know is interested in giving this pup the forever family he rightfully deserves, please contact the Carson Shelter - 310-523-9566, and reference the shelter ID #A5183597 and A5183596. 17 Responses to "Senior bonded sisters keep each other strong as they formally placed on death row"
I hope you can pull this through, but you are across the country. They are in CA. Hi - if you would please contact mybestfriendrescue@gmail.com. I’m going to try to coordinate their rescue tomorrow. Any update on these two?? I am in SC and willing to adopt if I could get help with transport cost! I have adopted several senior dogs! They are my soft spot! I will take both and love them and pamper them for the rest of their lives! You clearly are writing from a FB page you have already seen about these precious dogs! It is much more effective if you would give the FB link and update your posts, STOP WASTING EVERYONE'S TIME!!! SO MANY PEOPLE KEEP SHARING YOUR PAGE WHEN THE DOG OR DOGS WERE RESCUED AND SAFE DAYS AND DAYS AGO!!! THOUSANDS OF DOGS WILL DIE TO TODAY BECAUSE NO ONE KNOWS ABOUT THEM!!! IF YOU CAN'T TAKE THE TIME TO UPDATE YOUR PAGES, THEN DON'T DO THEM AT ALL!! !